At almost 40cm in height, these two ewers are unusually tall. The chasing work on them is also unusually fine and yet both show pleasing signs of use – there is light wear and a pleasing patina. The tea pots are not a pair but almost certainly are from the same workshop and most probably are by the same artisan. The dimensions are almost identical but the motifs employed in the etching differ. The body of each is engraved with bands of scrolling flowers and leaf motifs. Each has a central raised tear-drop cartouche engraved with peonies and other blooms in quatrefoil arrangements reminiscent of traditional Timurid designs. 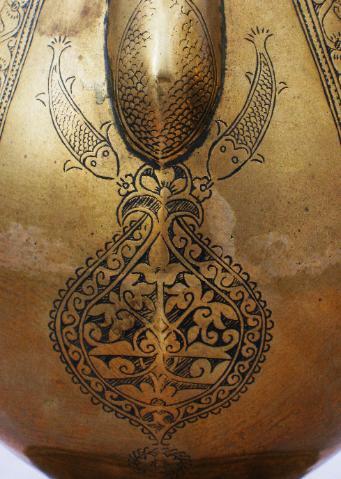 The base of the spouts are engraved with Timurid-like trilobed pendants, stylised orchids, and fish scales. The lids are high with six sides that flatten to a dome, feature open-work stylised lotus blooms, and rise to a lotus-bud finial. The base of one is engraved with a pair of fish, front and back. 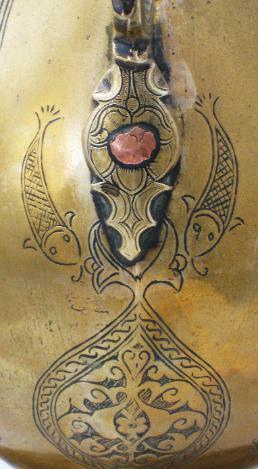 Small fish have also been worked into the Timurid-style panel engraved on the neck. Says Kalter (1997, p. 119) in respect of a tinned copper Bukharan sherbet bowl that also has fish as part of the motifs used on it, “The upper band is decorated with bold nashki script, while the main design consists of cartouches with highly stylised vase motifs alternating with roundels enclosing Greek crosses and opposing fishes. The fishes and the script – clearly indicate its Central Asian origin.” The base of the other is engraved with stylised fish motifs. The flared foot of each is also engraved. One has a border of four-petalled flowers within squares which Kalter observes is suggestive of Central Asian provenance. The other has floral pendants infilled with cross-hatching to match the fish scale motifs used elsewhere on the tea pot. makara with jaws gaping; the bottom jaw being attached to the neck of the tea pot and the upper jaw attaching to the lid. 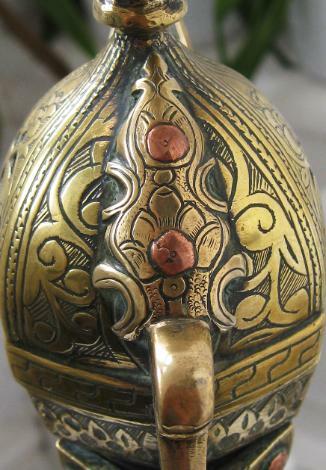 The copper rivets used to attach the handle to the flange of the lid appear as eyes for the makara. The finishing on the bases of each are the finest we have encountered, with sheet copper carefully hammered and secured into the interior of the base rather than being hammered over the foot. makara, pairs of fish, orchids and lotus – all evocative of the Silk Road trading routes with the blending of influences from China and India with those of the Islamic world.